I’m in a debunking mood today, probably brought on by the seasonal “double Moon hoax” that raises its oh-so-wrong head every August. (Read more on that nonsense here.) So here’s one more thing to say “NO” to: giant alien cave crabs on Mars. Apparently there’d been some buzz recently in the “space woo” circles online over an image acquired by NASA’s Curiosity rover showing an exposed rock outcrop on Mars. In the image, tucked into a corner between a couple of larger rocks, is an oddly-shaped… thing… that some of the more “open-minded” (sarcasm intended) viewers have claimed is an alien organism, not unlike some that have made appearances in various sci-fi films over the years. 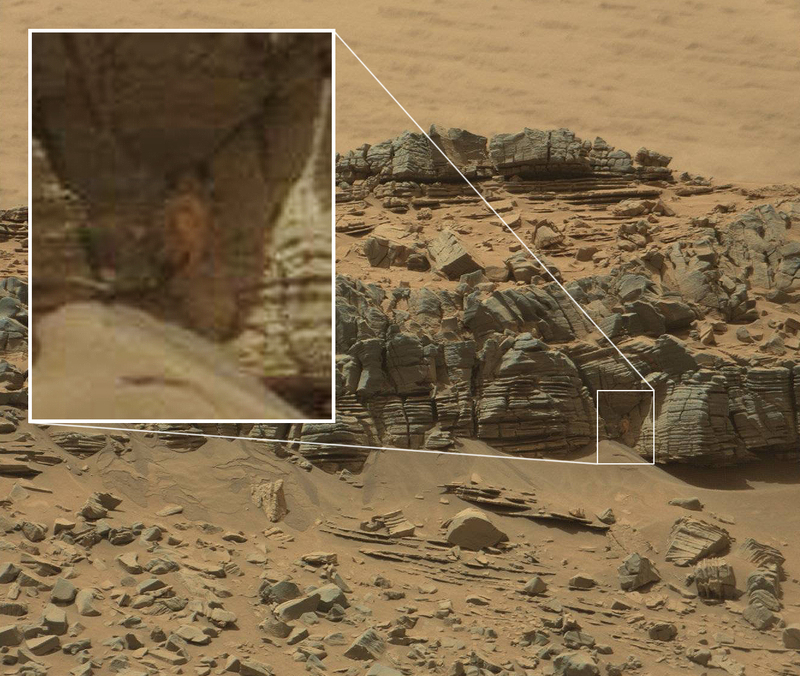 I’ve included the original Mastcam image above with the object in question outlined and “enhanced” on the left. Is this indisputable evidence of tentacled cave dwellers on the Red Planet? Hardly. Let’s keep in mind that the image is a compressed JPEG (you can see the original for yourself here) and as such there are pixel artifacts all over the place. Fine detail is difficult to discern at the distance that the image was acquired, and the compression doesn’t help. Also, the image was captured on mission Sol 710. That was, August 5, 2014 – over a year ago! Curiosity has long since moved on from this area near the dangerously soft sands of “Hidden Valley”…wouldn’t you think that if a crab-like critter was spotted they’d have hung around for a closer look? For crying out loud, if a slab of suspected hydrologic mineral is found beneath the rover’s tires they’ll dedicate a month or two to checking it out! And this was around the same time that ESA’s Rosetta mission was arriving at comet 67P – if NASA’s own robot was spotting tentacle-waving aliens on Mars I suspect someone at HQ would want to throw that out to the wires. Remember the gorilla on Mars? Needless to say it wasn’t a gorilla on Mars. So no, our first discovery of extraterrestrial life probably isn’t going to come from some fringy internet forum where members with black-almond-eyed avatars squawk about secret alien autopsies, suspected Nibiru sightings, and ancient lunar pyramids. So what IS that thing? (And yes, I see it too.) It’s most likely just another dust-coated rock formation in Gale Crater, carved by wind over many tens or hundreds of thousands of years into something that looks a bit strange – especially when compressed into image data that’s shot 150 million miles through space. (Give or take a few million.) It’s not an alien – it’s pareidolia, and it’s what we get when our lazy eyes and lizard-brains conspire to make quick sense of something unfamiliar. “Recognizing a crab in a landscape filled with wind-weathered rocks is no more surprising – nor more significant – than seeing a winking face in a semi-colon followed by a parenthesis. 😉 ” Read more here. Also check out a heavily tongue-in-cheeked article on this over on io9.com and another more sensible one on CNET here. *Can I say I know 100% without-a-doubt that this isn’t a picture of a Martian cave monster? No, of course not. But the likelihood that it’s a rock or other geologic formation is much, much higher than that that it’s a living, breathing, macroscopic organism currently eking out a living on the surface of Mars, one of our robots caught it on camera, and no scientist or team member bothered to even mention it. What will Mission to Mars eventually bring to us? sandeept252 they will not tell us …. stay quite …. As I just said, ignorance leads to credulity. A favorite quip of mine is: Open-minded is good! But not so much that your brains leak out! Enjoyed reading this I also rolled my eyes heavenwards when reading ‘vox populi’ opinions in the newspapers. I also like a little intended sarcasm from time to time. Oh I c a crab! No is just rocks dude! Hey I c Sponge Bob Crabby Pants! Yah is him alrite! Ok, I can believe that some people see a crab in that picture, but the gorilla one,seriously?? as you said in your article that its hard to conclude from jpeg image then why you take your own conclusion that it was only a rock? 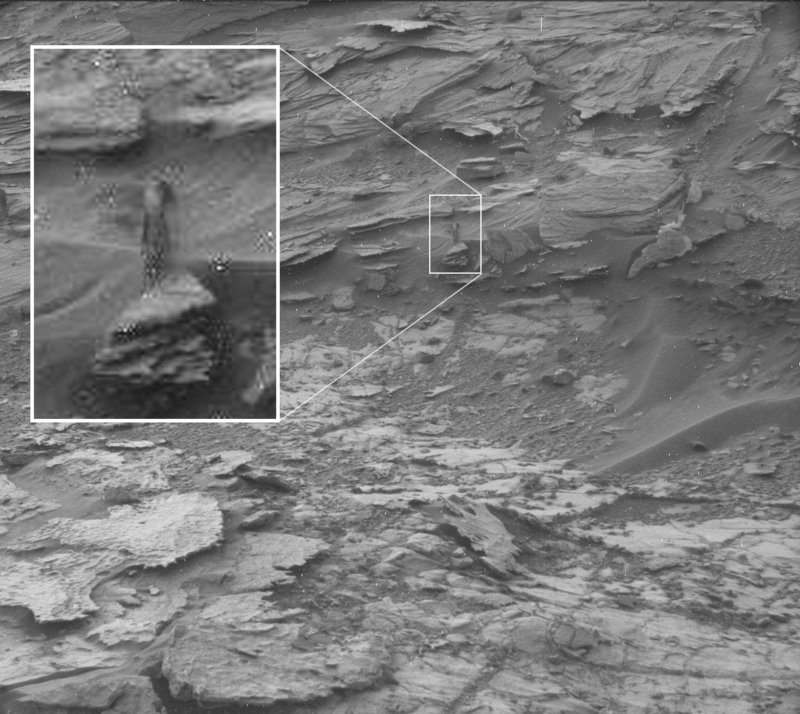 its funny when you sure that it was only pareidolia but in otherhand you say its hard to discern the details because its only jpeg image..
It’s all about probability… the chances that it is a rock formation are incredibly higher than the chance that it is a large organism living on the surface of Mars. And since the JPEG is inconclusive, one must go with the more likely circumstance. Well since there is in fact water on Mars, you can’t say anything for sure anymore. Yeah, no. It’s something notable There’s no way something that sticks out THAT MUCH from the terrain is just a rock. Most other images can be claimed of paradolia. Not to mention that the “enhanced” image does NOT clearly display what appear to be a face (this is likely the part of paradolia) and APPENDAGES. No way? Why not? The rover has found some really oddly-shaped rocks in its journey, such as the recent “spoons.” Mars has had a lot of time to sculpt rocks over the last several million years.